Anybody need a stylish way to tote your camera equipment? Kelly Moore bags are gorgeous and functional, designed by photographer Kelly Moore Clark. A few years ago, Kelly couldn't find a bag on the market that had all the features she wanted, so she forged ahead and designed her own. The result is a beautiful line of bags with repositionable dividers and a host of pockets for stashing your gear. See that B-Hobo bag up there in mustard? I have it. I'm crazy about it. The other day I took my camera stuff out and replaced it with folders and notebooks for a meeting. Very versatile. These aren't just for ladies—there are bags for dudes, too. 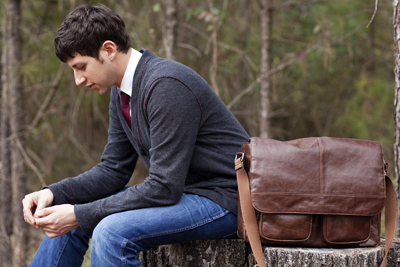 This gentleman is reflecting on how he has no friends in the world, except for his trusty Kelly Boy bag. 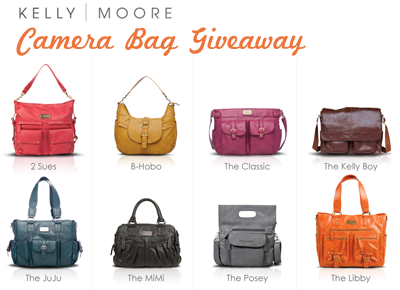 Kelly Moore is giving away a camera bag to one lucky somebody. For a shot at winning it, leave a comment on this post with your favorite style and color. Be sure to include a link, email address, or other way of contacting you. The giveaway closes Friday, August 26th at midnight CT. A winner will be randomly drawn, contacted, and announced here on Monday the 29th. Get $15 off your purchase from the Kelly Moore shop, now through Sept. 16, 2011. Just enter the code HowAboutOrange at checkout. If you like what you see, follow Kelly Moore Bags on Facebook and Twitter, too! Update: Giveaway is now closed. The winner is commenter #1830, Jolanda. Congrats! LOVE Kelly Moore bags! The B Hobo in gray is my fav. Love the MiMi! I'm not sure if I would get basic black, or a fun color like hot pink. I love the Mimi in Lavender!!! The bags are so chic! I especially like the Kelly Boy bag in mustard, but I share a camera (and bag) with my hubs, so he would probably want the brown. Men! love the 2 sues in raspberry! what a great prize! I absolutely loooove the JuJu bag in walnut. All of the bags are gorgeous, but that one is my favorite! I love the Classic Bag in purple! I love them all really. Ohh I love the MiMi in Grey. The Mimi Bag in Lavender is SO incredibly perfect - I would LOVE to win that one! Thanks for the Opportunity!! Definitely the Libby in orange!!! I love the Libby in orange!! I LOVE the Mimi bag in grey/black. What a great find! I'm drooling over these gorgeous bags. My favorite is the 2 Sues in Raspberry. I would love the Posey in gray! I have the b-hobo and LOVE it! (got it for my birthday a couple of months ago). I would love for my husband to have the Kelly Boy in that nice dark brown. I can speak from experience when I say that these are made so well and really thought through to accomplish both style and function! Sweet. I'm with Mrs. Z, that the Kelly Boy Bag in brown is the one! What a great giveaway! MY favorite is the Kelly Boy in mustard. Thanks for the chance! I'd love to win one of these! My favorite is the two sues in rasberry! So lovely! What a great giveaway! I don't stand a chance, but I love the 2 Sues bag in Mustard. So much fun! Tough choice- I woould choose the b-hobo in gray for me and the kelly boy in brown for my husband! Love these bags! I was just thinking I needed a stylish camera bag. These are really nice bags! I like the 2 sues in raspberry. I LOVE the B-Hobo bag!! I really need it! I think it would look fabulous on me in Coral!! Walnut would work too!! But I LOVE pink!! Love these bags!Love the Libby in gray! I love the B-Hobo in mustard, too! I love the Libby in Orange! Wouldn't even know how to begin with bag or color because I adore them all! i love the b-hobo bag, but am completely torn between the mustard and the heather gray! Love the hobo in grassy green-would be great for carrying around my camera! The boy bag in mustard--oh my! so hard to decide. I think it would have to be the classic bag in muted teal. Thank you! Pick me! Pick me! I love the bags... couldn't decide between BHobo and Classic until I saw the Cranberry Croc for the Classic - my fave! These are beautiful bags! I love the 2 Sues and the Classic both in grey. Love the Kelly Boy.. especially since my fiance uses the camera just as much as i do.. I love the B-Hobo Bag in Heather Grey! Wow - these are beautiful. I especially love the JuJu in muted teal! I would LOVE the Libby in mustard. OOooh!!! So smart! I like the Kelly Boy Bag and B-hobo. Mmmm, the B Hobo in grey is luscious! I just can't decide between the 2 Sues (walnut) and the Libby (Caramel). These bags are AWESOME! Love all of them! My favorite is the Juju in orange! The mustard 2sues is gorgeous! I could totally rock that Juju bag in slate grey. I have to say I love the Hobo too! All of them are so cute - i want them all! I like the mimi in mustard! Love the hobo in gray, so pretty! I absolutely love all of them, but the 2 Sues in grey is my fave! Love the Juju Bag in Muted Tel. I really want to win these !! love the brown in the Classic! What a tough decision! I might take me hours to choose my favorite one. I've already taken 30 minutes just pouring over one or two of the bags because they are all so awesome! If I had to choose just one, I would probably go with the Ju Ju in Teal or the The Kelly Boy in brown. I love the JuJu bag in slate grey! Love The Libby in orange of course! I LOVE these bags! Especially the JuJu Bag in Slate Grey! Love these bags! I have a boring camera bag. I'd love the Libby bag in blue, or slate, or or or any color. i love the libby bag in caramel! The Libby gets my vote. I love how tall it is and how wide the handles are. I'm kind of sweet on the colour orange too! Gorgeous! Really love the JUJU in the teal color. Amazing :) Thank you! I'm drooling over the Libby bag in Caramel. I have been talking about how badly I need a bag like this. LOVE LOVE LOVE the B-hobo in yellow and the Kelly Boy in brown! I would be a happy camper with any of them! The b-hobo bag in muted teal is gorgeous! Wow! I totally covet these bags! I'm also in love with the mustard color but I've got my eye on the 2 Sues bag or the Kelly boy. Great giveaway! Thanks for the chance to win! Yay! A teal B-Hobo will be fabulous w/ my perpetual jeans. There are just so many to choose from, I love them all!!! Kelly Moore Classic Bag | Cranberry Croc. It is so much like a purse. Please pick me at cymberlee_sweetchic@yahoo.com. My favourite is definitely the kelly boy bag in brown, It looks so classic & versatile. Ugh, I realized I need a camera bag the other day when the tote I was carrying my camera stuff in collapsed and the 50mm lense hit the flood. I Love the hobo in grey! hmmm so hard because I love them all but i think i would pick the mimi! This is such a generous giveaway!! Thank you for having it:):) The Brown Kelly Boy bag would be great for my husband! He'd be completely shocked! Yes! I love 2 Sues! If the universe would only be so kind! Thanks for letting em try Jessica! Love the classic in pink! Love these bags! My favorite is the Mimi in gray! i am loving the b-hobo in grassy green. that shade of green is one of my favorites. and in a bag like that, it's just perfect. I love the 2Sues in the Raspberry! So very beautiful all of them! Ooooo! They are beautiful! I would love the Posey Bag in Teal. It is amazing! Libby... in Orange. The need to carry my camera and laptop without looking like I'm doing either is overwhelming me. It would be a huge help! The Libby in ORANGE! But to be honest I love them all!!!! The Libby in orange is pretty much what dreams are made of! I love this bags! Gorge!! I love the 2-Sues but really can't go wrong with any of them! Good luck everyone! The Kelly Boy in grey is my absolute fave! Love the B-Hobo in grey! oh! the libby in Grey! It's great to have an option that actually matches a nice outfit for an event as opposed to looking functional/drab. I love the Kelly Boy bag with the Hobo as a very close second. They're all awesome and beat the pants off the sad black thing I currently tote around. Great giveaway! oh goodness I love them all! I have a libby. so I think I would love Mimi...I can't open her site to look at colors, so I would take any. I love the mustard color and the hobo bag is the best one! But they're all quite nice. My favorite so far is the 2 sues! I just ordered it in Grey and canNOT wait to receive it! I used to be a yellow girl, but I just love Mimi in Lavender. I have a libby, so I would love to get a Mimi. I can't open the site right now to look at the colors though; so any would be fine. I love Kelly Moore bags!!! I especially love the Libby bag in orange!!! So cute! i love the kelly boy bag in brown or mustard! there are so many delicious colors, but i think for practicality i'd go with caramel. These are great! I'd go for the B-Hobo in grassy green. i've been looking all over for camera bags! i looooove the posey in grey. desperately in need of a new camera bag. these are FANTASTIC. and beautiful. Ooh I LOVE the "Libby" bag in Sapphire!! Gorgeous! The Kelly Boy Bag in brown is so dreamy. Love it! I absolutely LOVE the B-Hobo in yellow! Fingers crossed!! Well that's a very hard request to have to choose, haa-haa. I quite like the Kelly Boy & the Libby. These are gorgeous. I love the 2sues! I ordered it in grey and canNOT wait to receive it! love the 2 sues in mustard! Thanks for the giveaway! I love the 2 Sues in Mustard. That memory card/credit card pocket is amazing! the Posey for me!!!!!!!! so glamorous and practical at the same time! LOVE the B-Hobo Bag in Heather Grey! This is so Awesome!!! Call me boring, but I love the Classic in Muted Teal. the classic in blue! i have been wanting a Kelly Moore bag for the longest time imaginable! I love the B-Hobo bag in heather grey. I wish I had found these sooner. Kelly Boy Bag in Brown--love that you can hold camera stuff AND baby stuff! Oh my! I must have the B-Hobo in Mustard!!! I daydream about Kelly's bags & am trying to save for one for Christmas our budget is SUPER DUPER tight but Oh to be able to carry my camera in a Posey bag instead of the diaper bag I am using (shhh) OH that would be HEAVEN! thanks for the chance. I love these bags so much... how could I possibly narrow it down to one? Love these Kelly Moore bags. I would pick the Mimi bag - love all the colors. The Libby bag and the Kelly Boy Bag... OH goodness.. will someone please contain me! Just LOVE these bags and totally want one. I love the Kelly Boy in grey!! I mean, I also love the B-Hobo, but the Kelly Boy is all around perfect for business, pleasure, any outfit, any location, AND for boys or girls. I just think it's the perfect bag!! Thanks so much for the giveaway!!! CAn't decide!! I love the classic and the Juju, AND the b-hobo. I do love the mustard and orange, AND grassy green. AND muted teal. I don't know how I'd decide!?! I LOVE THESE BAGS.. I have been wanting to get the B-Hobo or the JuJu for a while now.. I love love love the classic and hobo in teal. Gorgeous! Love the hobo green one!! the hobo in mustard for me :) i love it and it's out of my comfort zone! I love that Orange Libby bag! All of them. Each and everyone! The orange Libby steals my heart though. It's so hard to choose! I love the Libby in brown, though!! Love the Libby in Orange! NEW FOLLOWER!!! The Libby is my absolute FAVE and I would choose the orange or Brown! LOVE IT! My favorite is the Libby Bag in Caramel! Thank you for this amazing giveaway! B-Hobo in Muted Teal. So Pretty! I LOVE the Posey bag in Orange or Grey. It's so cute! Classic or Kelly Boy would be my choice! they are all amazing !!! my fav is the juju in blue. I love the hobo in grey! I really love the Boy Bag in Brown! I suppose that way my man could carry my stuff and whine less, haha. OMG! 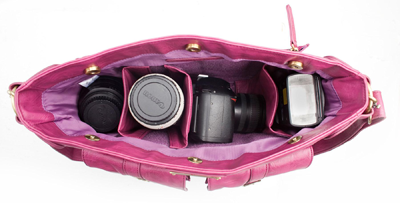 I've been needing a new camera bag for my new (bigger) camera...so it would be great to win. The Classic in Cranberry Croc rocks my world. I love the mimi in lavender!!! These seem like such great bags, I would love to own one!! Great bags! I'd love to have the Kelly Boy Bag in black as it's the perfect gift for my brother! i have dreams of owning the 2sues in gray! Love, love these bags!! I LOVE them all, but especially the classic and Juju bags in grey. Thanks for the chance to win! love the kelly boy in brown! so awesome! I would love the Boy Bag in Brown. I would LOVE The Libby in Hot PINK :) Heck, any bag in any color will do! It would just be a blessing to win any Kelly Moore Bag in any style and in any color ....soldiermedicwife@yahoo.com thanks! The orange Libby is my fav. These bags are phenomenal! I have 3...yes...3...And I WANT ANOTHER! Currently have my eye on the 2 Sues in Grey! I'm such a sucker for pretty grey bags! I have the Libby Bag in the grey color. The one thing I love about it - being a reporter - I can carry both my cameras, my lenses and flah AND my digital recorder and tablet and still have room for more. It is the best investment I've made to date! Stylish, functional and the grey goes with EVERYTHING!! What a great give away! I'd love to own the 2 sues bag in raspberry! I love the Kelly Boy in brown -- classic, and both my boyfriend and I would gladly carry our shared camera equipment in it (I'm not so sure he'd love sharing a pink or purple bag with me quite so much!). I love the b-hobo bag in heather gray...her bags seem perfect! 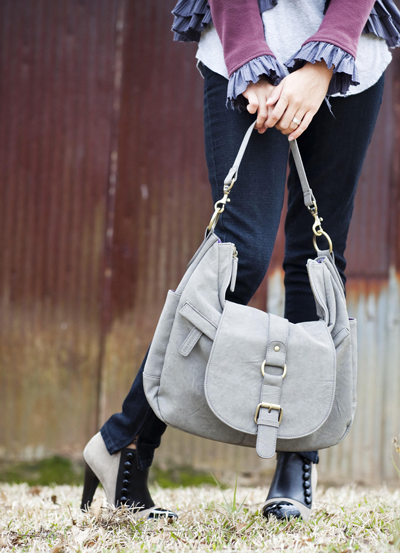 I would die for a Kelly Moore B-Hobo in gray... such a phenomenal bag :) Its at the top of my Christmas list for this year! ...no, I think I would want the Mimi bag in gray..yes, its ability to carry popcorn has absolutely won be over! I would love to have the libby bag in orange! The orange is so bright & fun! I have the hobo bag & brown & it is perfectly classic! The Libby in orange was tempting but I'd have to say : Kelly Boy Bag in Brown!